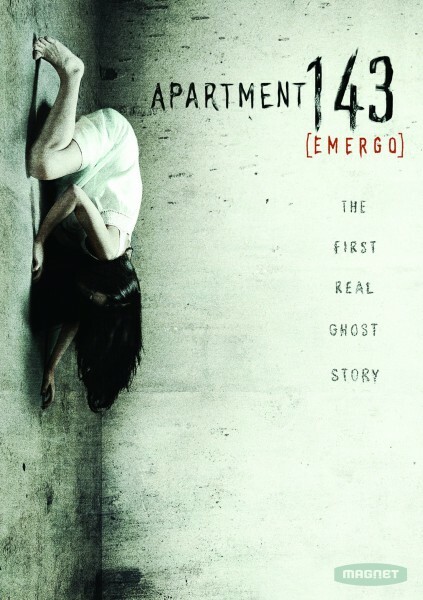 Apartment 143, or Emergo as it was originally titled, follows a team of ‘ghost hunters’ from an (unnamed) institute specialising in parapsychology who are investigating a haunting at the eponymous apartment which belongs to the White family. The White family’s life has recently taken a nose dive, with the loss of Alan’s (Mr White) job and the death of the mother in a car crash leading to the family downsizing into the shabby apartment in an almost empty block of flats. Since the death of Mrs. White strange events have been occurring to the family and Benny, the four year old son, insists that his mother is neither dead nor alive. The final member of the family is Caitlin, a sullen teenager who is predictably uncooperative with the incoming team. The team of paranormal investigators ticks all the diversity boxes, consisting of a white middle aged man, Dr. Helzer (Michael O’Keefe, Frozen River) a blonde Irish female assistant named Ellen (Fiona Glascot, Resident Evil ) and Paul, a cocky, Hispanic techie (Rick Gonzalez, Coach Carter). The investigators are equipped with the expected array of gadgets, including multiple still and video cameras (with the obligatory scene of the cameras being put up) and various probes. The largest negative of the film the amount of pseudo-science used in the film to explain away what the researchers were doing and the ensuing supernatural events. The film relies too much on vaguely scientific long words and pop psychology to explain and link a series of gratifying frights. The jumps start early into the film (only six and a half minutes in to be exact) and continues to build throughout the film. The narrative is fast paced and straight forward with an obvious beginning middle and end. Apartment 143 is filmed in the typical low budget hand held camera style, from both hand held cameras and cameras in the side of Ellen and Paul’s head. The director, Carles Torrens, uses almost all the well-known cinematic techniques (including night vision and strobe lighting) and plot devices (the use of a medium to contact the ghost, hidden secrets in the family and so on) to great effect and produces a variety of scenes to keep the viewer on the edge of their seat. In fact, Apartment 143 is a very good candidate for supernatural horror film bingo! Whilst the plot of the film is unoriginal and the techniques used to generate scares are well known it is a well-made and well thought out 80 minutes and delivers the desired jumps and shocks throughout the film. I would recommend it to anyone looking for a decent ghost film and I look forward to seeing what Torrens does next.